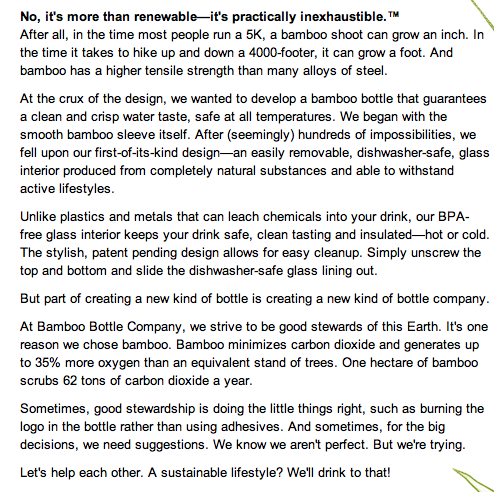 I was recently given the chance to review the Bamboo Bottle. I had never heard of such a bottle before and was quite excited to be given this opportunity. - how fast can I clean this, so I can try it out? 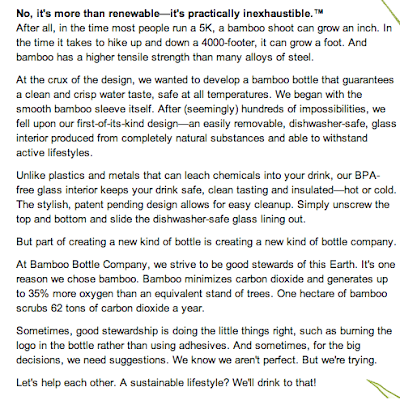 To clean the Bamboo Bottle, it was quite easy. First I took it apart in the following four pieces and I hand washed the plastic pieces and glass with hot soapy water. It is noted that the plastic and glass pieces are dishwasher safe as well, and I have put them in there. I just didn't want to wait for the dishwasher the first time around. I am impatient like that. It is very important to know that the bamboo cover is not dishwasher safe or microwave safe. In order to clean it, all you have to do is wipe it down. That's it. Nothing more. There are four pieces in all. After cleaning the pieces, I put all the pieces back together. Be sure to put the bamboo shell on correctly and line up the black plastic piece to the little space on the bamboo shell. I made the mistake of not doing this one time and found out that if the bottle is not put back together properly, and your bottle happens to fall over, you really shouldn't expect to have any water left in the bottle. It only took that one time to for me to learn my lesson. For directions on assembly, go here. I find it incredibly motivating to want to own more of these bottles based on the earth-friendly materials used in this water bottle. To me, water simply tastes better when coming from a glass bottle. I have only been drinking water from my bottle, but according to the website, you can drink hot beverages from it as well. The bottle does hold 17 oz of water. As I drink nearly a gallon of water a day (128 ounces), which means filling up the bottle 7.5 times a day. It's well worth the trips to the water cooler or sink if it means I am drinking my water from a sustainable water bottle. Right now you can get 20% off of a purchase of your own Bamboo Bottle by using the word "Health" in the coupon code box during checkout. I was provided this bottle to review and received no other compensation. The opinions expressed in this review are 100% my own. Yours is the second review I've seen of this bottle! It makes me want one even more :) Although honestly, the weight would be an issue for me. Hmm. At first the weight bothered me, but now I actually kind of like it. It's a sturdy bottle for sure. It is cute, isn't it!!! Yeah - should read them 1st!!!! I've never seen one of these... very cool! They are very cool. They definitely stand out. I bet you'd enjoy it! Cool - I've never seen them before. Thanks for commenting on my guest post at Fitness Cheerleader, I'm glad to have found your site! I've heard a bit about these bottles and am really curious to check them out. Looking forward to getting to know you better!